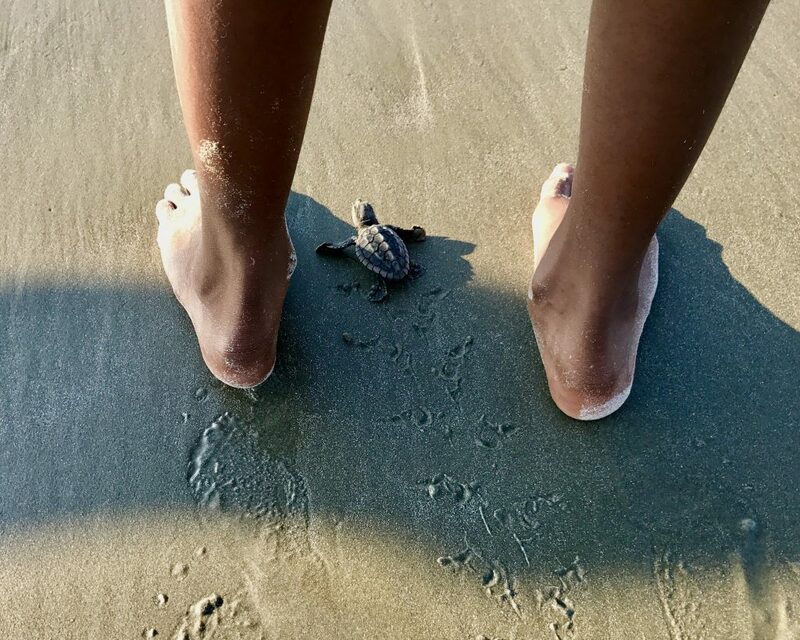 Baby sea turtle makes his way to sea. (Photo by Cindy Perry). 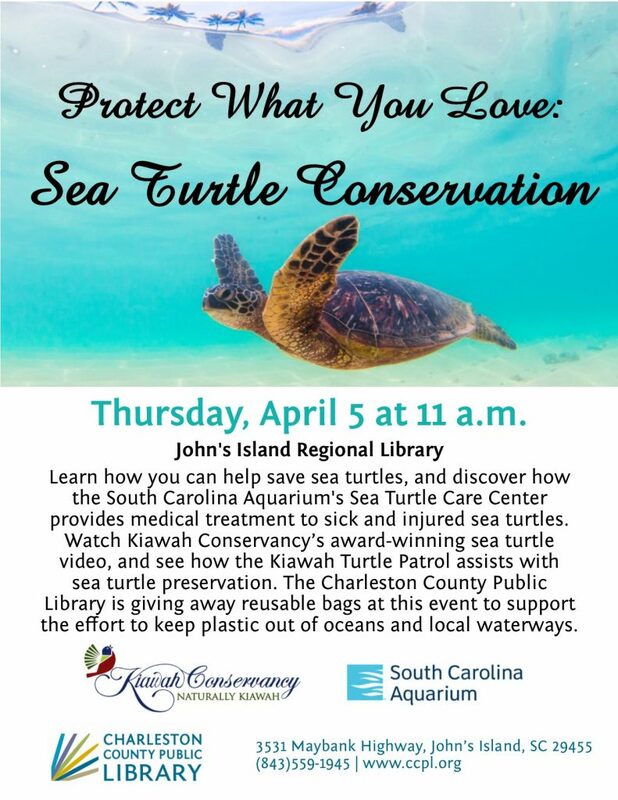 Thursday, April 5 at 11 a.m. the John’s Island Regional Branch of Charleston County Public Library will “Turn the Page on Marine Debris.” The presentation is a follow-up to CCPL’s receipt of a grant in June of last year. CCPL subsequently announced an end “to the distribution of single-use plastic bags in an effort to fight marine debris that pollutes waterways and oceans,” read their declaration. Sea turtle. (Photo by Kelly Bragg). Reusable bags will be given to attendees on April 5 while supplies last. “What I heard from the Aquarium was that individuals could make a difference through their choices. With that in mind, the library as an institution chose to end our use of plastic bags [in all 16 locations]. We also recycle. Whenever possible, we’re choosing to conduct our business in ways that are friendly to the environment,” said CCPL Deputy Director Jim McQueen, in an email. The program on April 5 will also feature speakers from the SC Aquarium, and Kiawah Turtle Patrol. Cindy Perry and husband Bill moved to Kiawah in 2009 and live there fulltime. 2017 was Perry’s first year on Turtle Patrol. Her enthusiasm for turtles, years as a trustee with the Kiawah Conservancy, and easy confidence combine to make her the natural choice for public engagements. “Most people know the Kiawah Conservancy for its efforts in preserving land and habitat, education is also an important component of our mission. 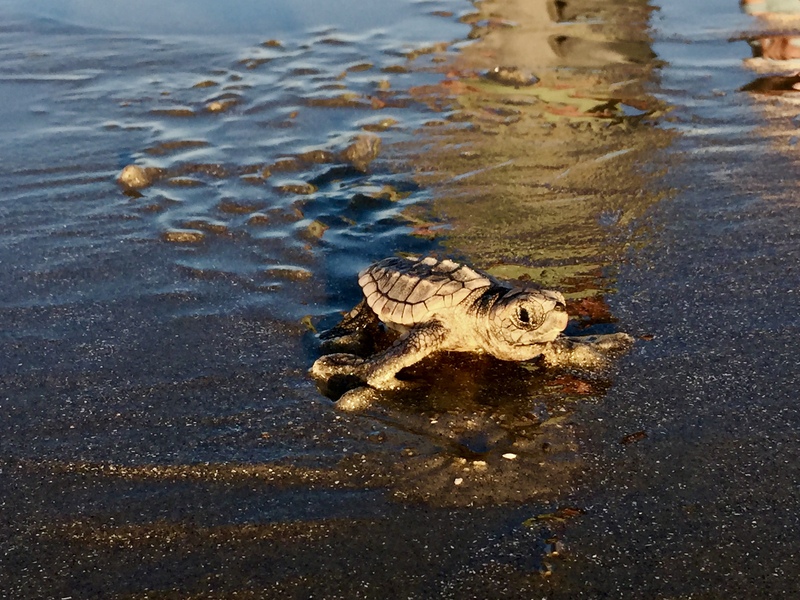 In 2015, we created a Loggerhead Sea Turtle documentary to enlighten others about the story of Sea Turtles, one of Kiawah Island’s most iconic and noble species. The footage is spectacular, including a mother sea turtle emerging from the ocean, making her way to the dunes, digging a nest, and laying eggs. “This footage is rare because of the difficulty of taking night footage. Photographers need special cameras that do not emit light, which might interfere with nesting. Viewers will also see baby hatchlings as they leave the nest and head out to the wide open beach. 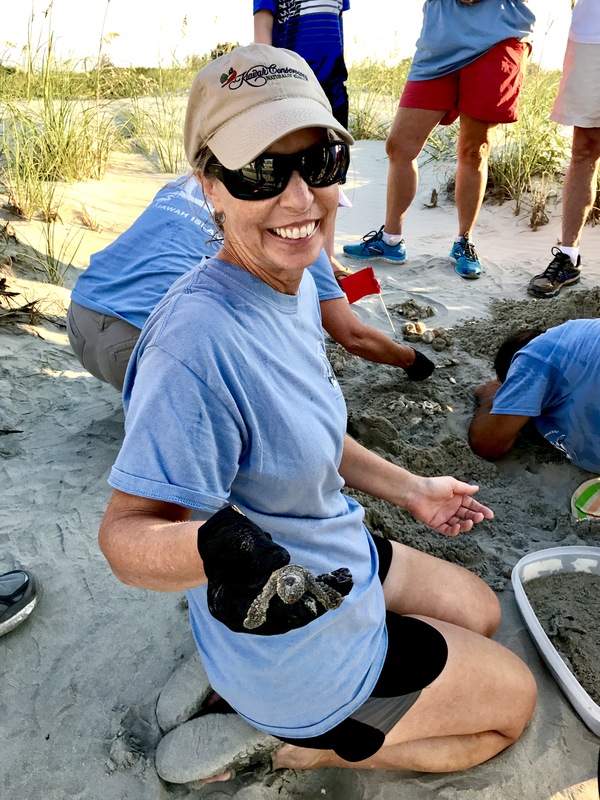 “The Conservancy wants to share this award-winning movie with others who may not necessarily live on Kiawah, to help them learn about sea turtles. We believe that the more that people know, the more sensitive they will be in helping not only sea turtle preservation, but also the importance of respecting all wildlife and habitat,” Perry said. The idea is for attendees to fall head over heels in love with the turtles, before Kelly James Thorvalson discusses some of the threats turtles face. Thorvalson has been with the SC Aquarium’s Sea Turtle hospital since the beginning, and is worried by the incidences they are treating. “We have seen an alarming increase in sea turtles being admitted into our Sea Turtle Care Center that have ingested plastics. Of 20 sea turtles admitted with GI plastics in 17 years, 15 [were] in the last 3 years. Many types of ingested plastics have been recorded including hard and soft plastics. Single use plastic retail bags are a concern for sea turtles, especially loggerheads and leatherbacks that consume jellyfish as prey, because these bags visually mimic jellyfish in oceanic habitats. Of the 20 sea turtles admitted with GI plastics, 11 (55%) contained plastics consistent with single use plastic bags. “Single use plastic bags have been identified as the second most harmful item to marine fauna after ghost fishing gear. They were also identified as one of the top two items posing the greatest risk for ingestion by wildlife,” said Thorvalson in an emailed preview of her presentation. Politics aside, what better place than a library to learn and form your own opinion? JIL has what you need, and will be ready to help you eliminate plastic on April 5 at 11 a.m.